A year in the life of our department, superbly compiled and organized by our Administrative Coordinator, Patrice Reeder. It looks especially good in color! This report summarizes student, faculty and staff activities and has an extensive alumni news section. 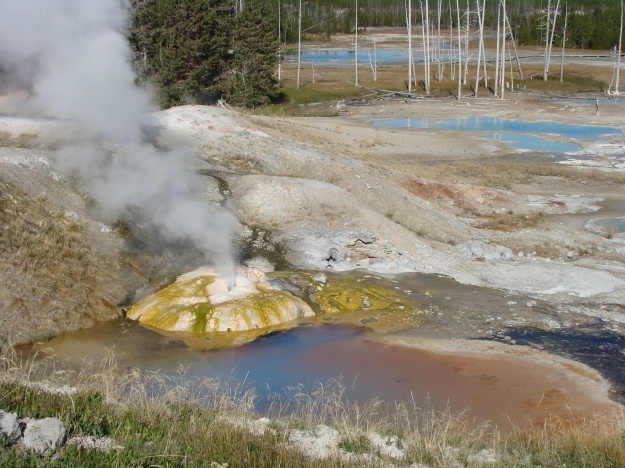 Then, our journey took us to Norris Geyser Basin, Obsidian Cliff, Sheepeater Cliff, and the Mammoth Hot Spring Terraces. All I can really say is “Wow”!! Above is a scenic view of one section of Norris Geyser Basin, which had some of the most interesting thermal activity in the park. 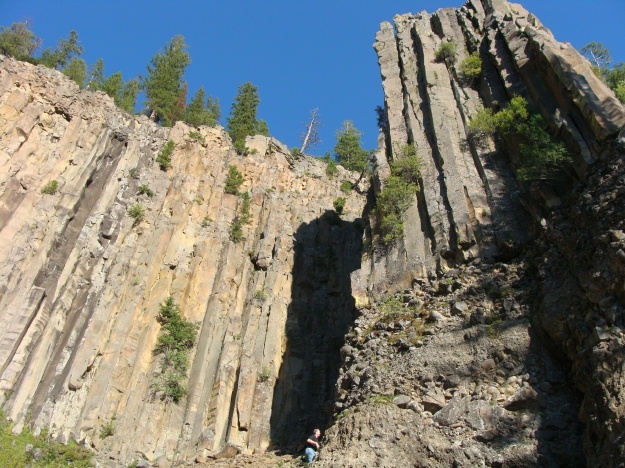 Take a look at Sheepeater Cliff, which is composed of basalts that exhibit columnar jointing. 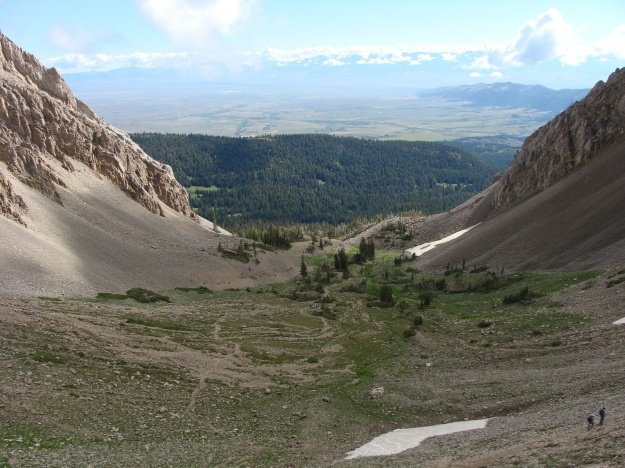 Sheepeater Cliff is a result of the bimodal volcanism that was present in Yellowstone. 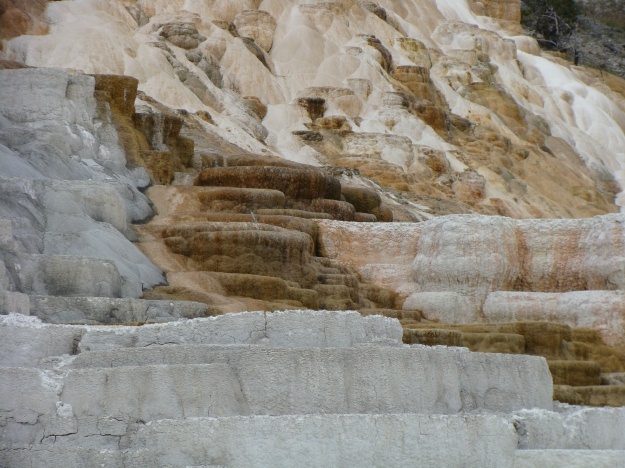 Mammoth Springs provided some wonderful exposures of travertine terraces, several of which were very active. 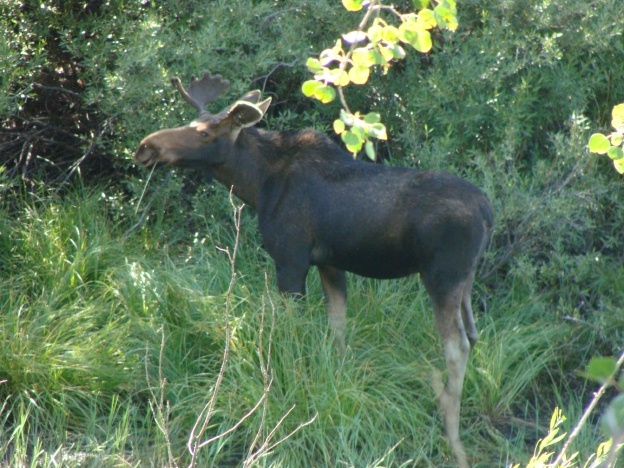 Of course, along our journey we made some friends, such as this moose grazing along the river bank. It was amazing how one creature could tie up so much traffic!! Yet another friend...a very, very large bison. The day ended with a trip to the Gardner River. 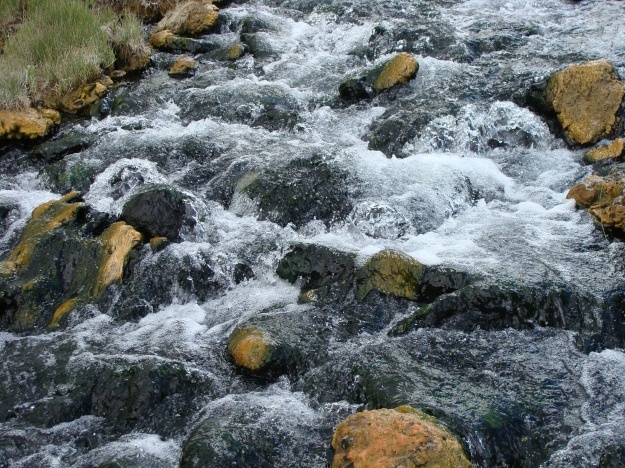 The picture above shows a small stream of thermally-influenced water flowing into the Gardner River. Along the river bank, temperatures are easily over 100-110 degrees F, and thus many people enjoy one of nature's very own hot tubs. But, if you walk just a few feet out into the main portion of the Gardner, the water is ice cold. Due to such great weather, the group decided to go for a 9.6 mile hike (4.8 miles up and up and up and then back down again). 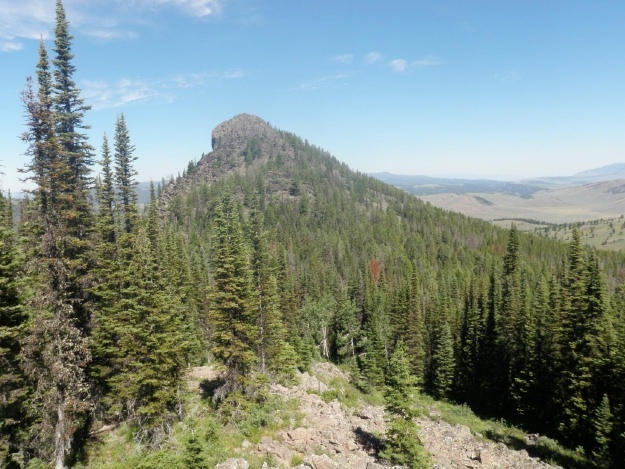 We hiked the Lupine Meadows Trail NNW of Moose, Wyoming — in Grand Teton National Park. 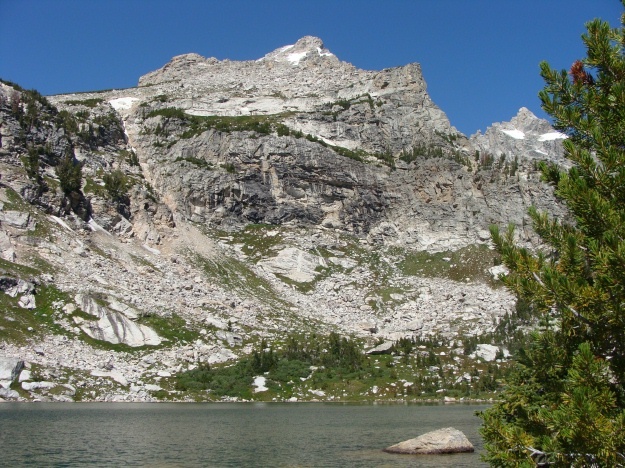 This specific trail takes you to Amphitheater Lake, which is nestled in between Grand Teton and Middle Teton. It was an absolute fantastic hike, with several switchbacks along the way. At the very top of our hike, we came upon Amphitheater Lake, which is located at 9,698 feet above sea level. Because I'm a big fan of oxygen, I noticed that I was not quite in Ohio any more. The hike provided us with a 2,960 foot elevation gain above the valley; therefore, there were spectacular views!! The Teaching in the Field Workshop left Bozeman for a whirlwind tour of Yellowstone and the Tetons. Our goal was to actually think about teaching in the field — while in the field!! Some of us concentrated on how we could incorporate our surroundings (particularly Yellowstone) in modules for specific courses that we teach; others of us were more focused on devising a department field trip. I could not think of better surroundings. 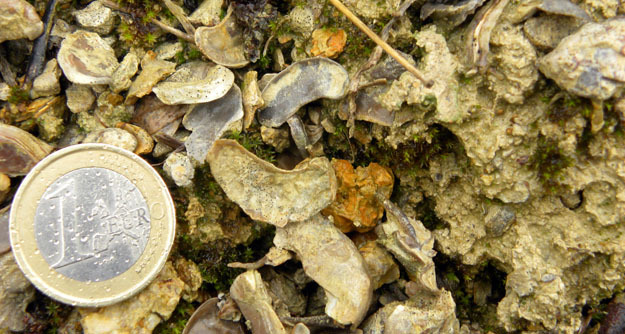 The field trip leader was Dave Mogk, petrologist at Montana State University, who has done much research in the area. On the first leg of our journey from Bozeman to West Yellowstone, we stopped at a talc mine just south of Ennis, Montana. 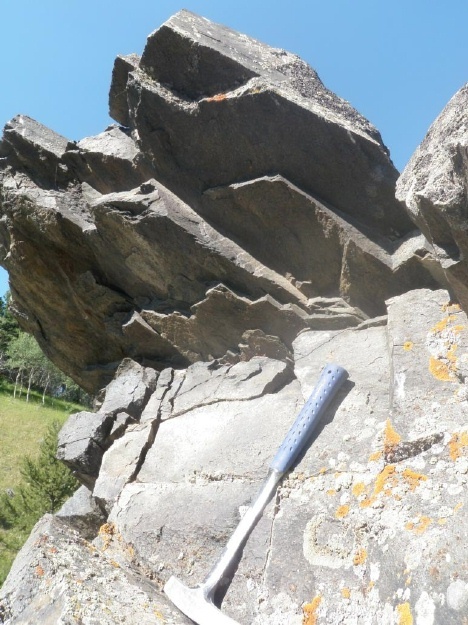 The talc mine is within the Montana metasedimentary terrane in a marble-hosted deposit. Nearby, we also looked at algomin-type banded iron formation exposures that contained small isoclinal folds. Afterwards, we headed toward Hebgen Lake to view the site of the 1959 earthquake that registered 7.5 on the Richter Scale and then onward to West Yellowstone. 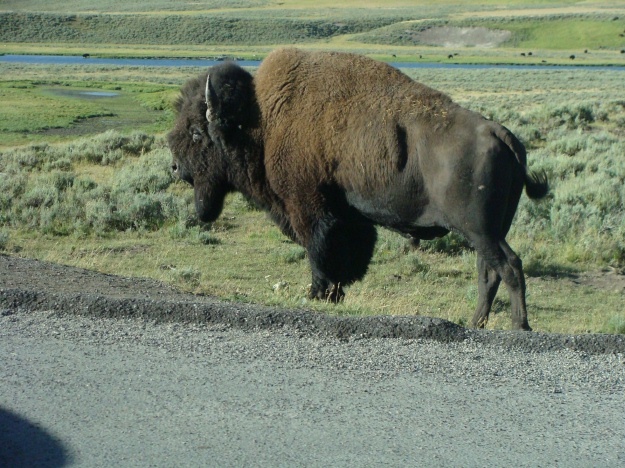 When in Yellowstone, we were able to visit a number of locations, but we only concentrated on the western and southern portions of the park. Never being to Yellowstone before, I was able to visit Fountain Paint Pot in the Lower Geyser Basin and Grand Prismatic Spring, before driving south toward Grand Teton National Park. Along the way, Dave introduced us to the regional geology, discussing such topics as the Huckleberry Ridge, Mesa Falls, and Lava Creek eruptive events, the Absaroka volcanics, the thermal anomaly vs mantle plume argument, and the structural history of the area. 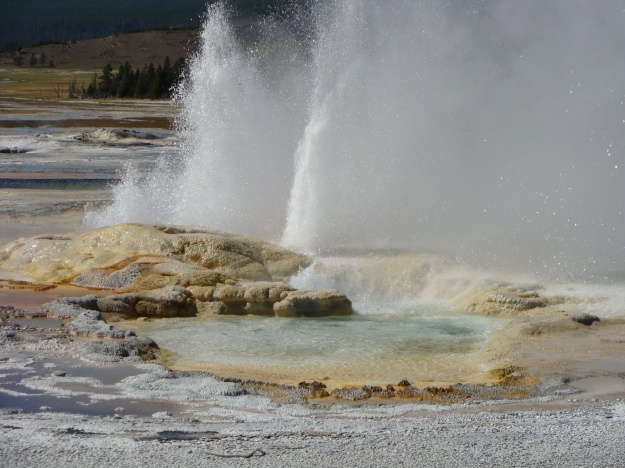 Above is a photo of Spasm Geyser, located in the Lower Geyser Basin. 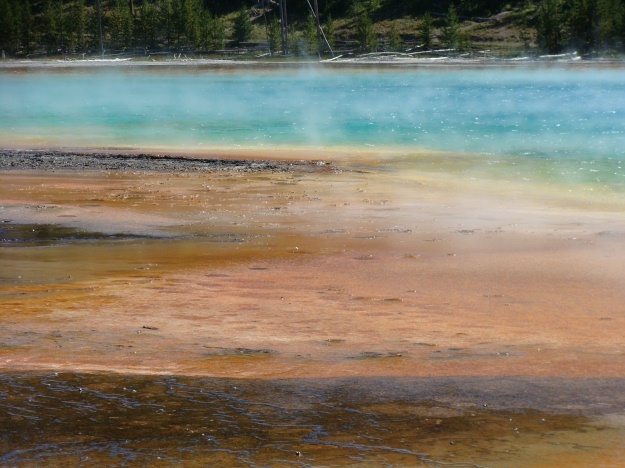 The colors of Yellowstone's Grand Prismatic Spring were incredibly beautiful. 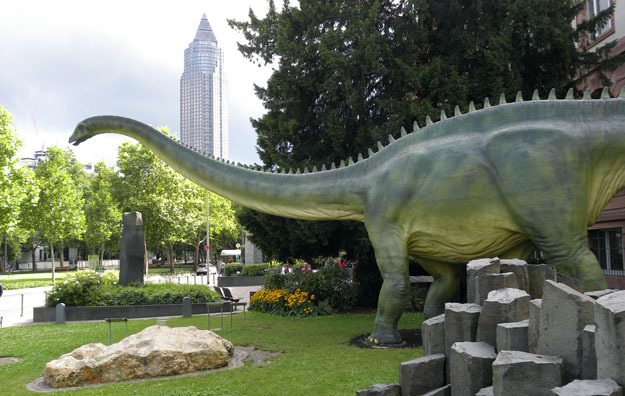 FRANKFURT, GERMANY–Isn’t that a great front yard for a Natural History Museum? Diplodocus longus strides by columnar basalt and a massive chunk of conglomerate. 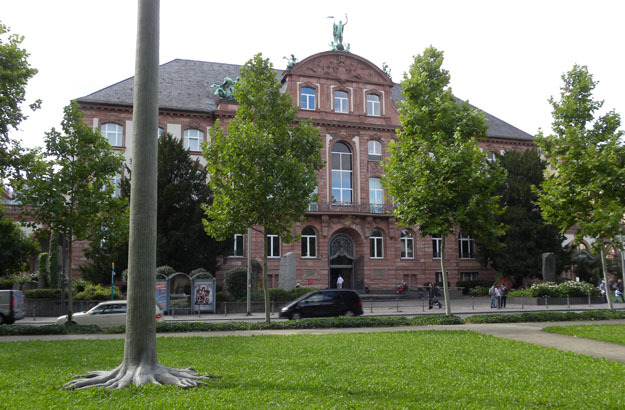 This is the Naturmuseum Senckenberg in downtown Frankfurt, about two blocks from my hotel. On my last day in Europe I met with Dr. Mena Schemm-Gregory, a brilliant young paleontologist who specializes in brachiopods. 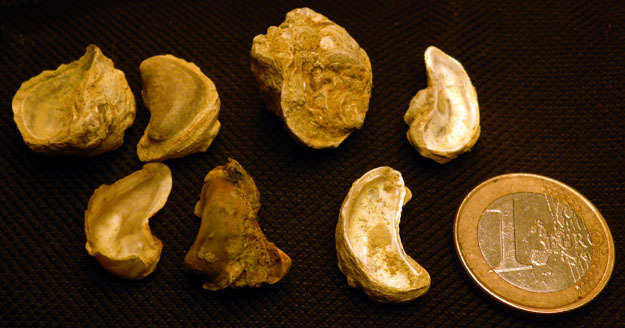 I was very impressed with the labor-intensive way by which she makes three-dimensional reconstructions of brachiopods embedded in matrix, including their internal structures. I also simply enjoyed the museum displays. This is a good way to end this eventful trip — a visual survey of the history of life! The front of the Senckenberg Museum, which was built in the first decade of the 20th Century. The tall object on the left is a life-sized reconstruction of a Carboniferous seedless vascular plant. I'm cleverly using it to hide an annoying smokestack in the background! 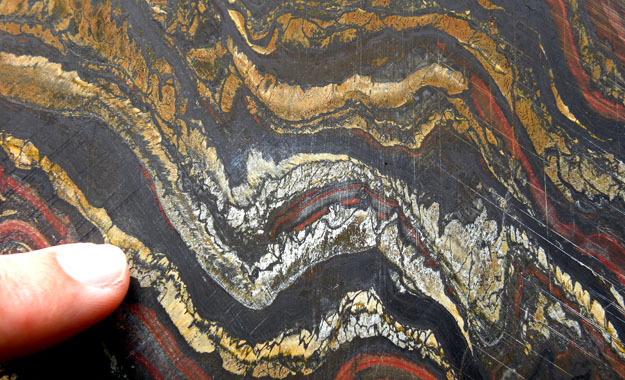 Close-up of a massive piece of Banded Iron Formation also standing outside the museum. This one is anywhere from 3.5 to 1.9 billion years old. It represents a complex interaction of ancient microbes, seawater and the atmosphere which is still not completely understood. Even the living plants highlight life's history. 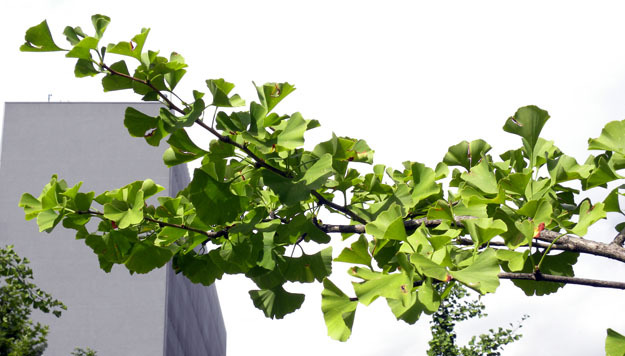 This is a branch of a ginkgo tree, a group which has an ancient lineage extending back to the Triassic. Er ist ein "Lebendes Fossil". Today, we ended the indoor classroom portion of the Teaching in the Field Workshop with a lively discussion on the use of technology in the field. Everyone seemed to agree about its usefulness in research; however, there were many different views when the discussion turned to the use of technology in the field when teaching students how to map. Digital mapping is used by state geological surveys and the USGS, but the techniques are not universally used in the classroom and in field camps across the country. When this friendly debate was concluded, it was time for dinner. Instead of eating in the conference room in the student union, the workshop coordinators had organized a picnic for us overlooking Hyalite Reservoir. 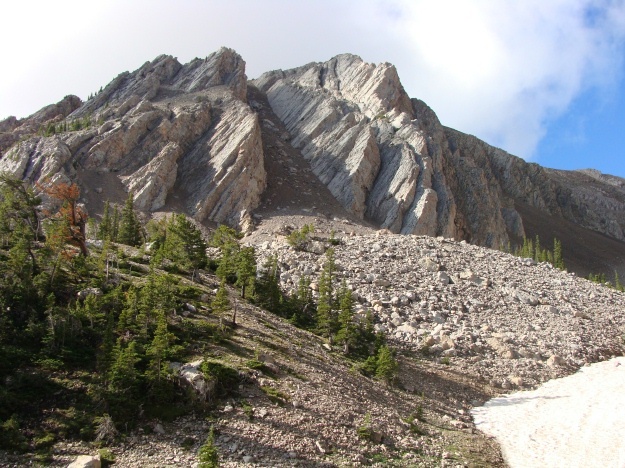 Hyalite Canyon is located just south of Bozeman in the Gallatin Range, and it exposes rocks of all ages — Archean gneisses through Eocene volcanics. Before dinner, we hiked to Palisade Falls for a spectacular view that underscored the fact that I was definitely not in Ohio. 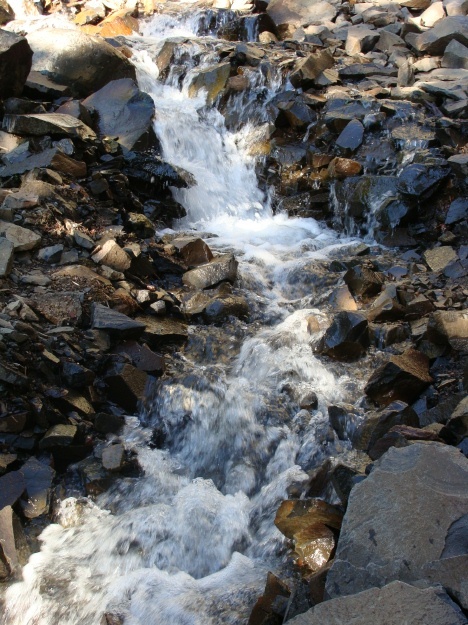 As we walked to Palisade Falls in Hyalite Canyon, we followed a wonderful stream flowing through a sub-alpine forest. Palisade Falls, shown above, was gorgeous during the early evening light. 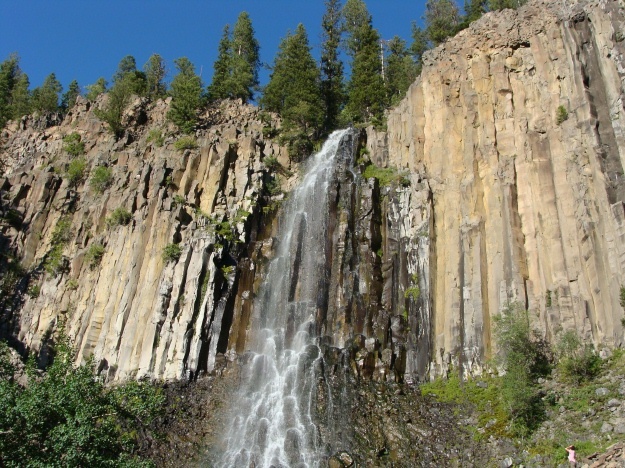 Notice the wonderful columnar jointing that makes up the wall for Palisade Falls. It was very difficult to pull 50+ geologists off of this outcrop, but dinner was ready!! The rest of the week, the workshop on Teaching in the Field is actually taking to the field to put boots on the ground. Dear Meagen and Shelley, I hope you both like extremely sheared metamorphic and igneous 2 billion year old rocks because I have about 100 of them coming to Scovel in about a week. But really I have had an amazing time in Montana and am sad to see my time out west coming to an end, yet I am happy to be returning home after 3 months of travel. I would have liked to update you all a little more often on what has been happening in Big Sky country, but the internet situation and the communication in general is rather limited. 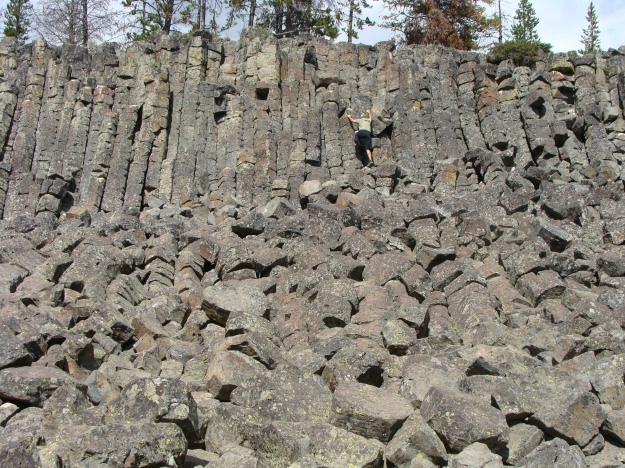 On our daily traverses we encountered diorite, tonalite, mica schist, marble, mylonite, amphibolites, quartzite, and Yellowstone related volcanics (although we weren’t particulary interested in these). We saw many signs of wildlife both actually seeing and other signs. Cattle sightings were especially common, but we also saw elk, antelope, moose, golden eagle, bald eagle, badger, marmot, ferret, fox, and hawks. Unfortunately, in my opinion, we didn’t see any bear but all the locals tell us they are there black and grizzly. There is still a lot of work to be done even though field work is over. 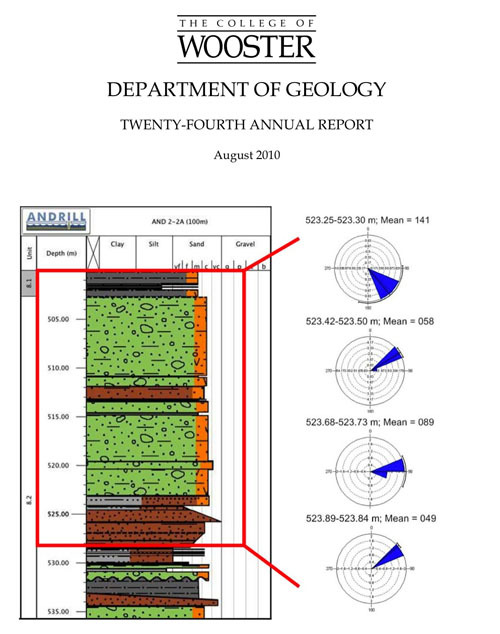 We came into the project with some general questions, but now we have the data, the rocks, and the field observations that we need to make a significant scientific contribution to the understanding of the geologic evolution of the area. This project marks a pinnacle achievement in the area which has had very little work done and is already misunderstood in the scientific community geologically speaking. I am looking forward to working with Meagen and Shelley on my project and taking the opportunity that the Keck Consortium COW Geology Department gave me to produce a significant piece of scientific literature. 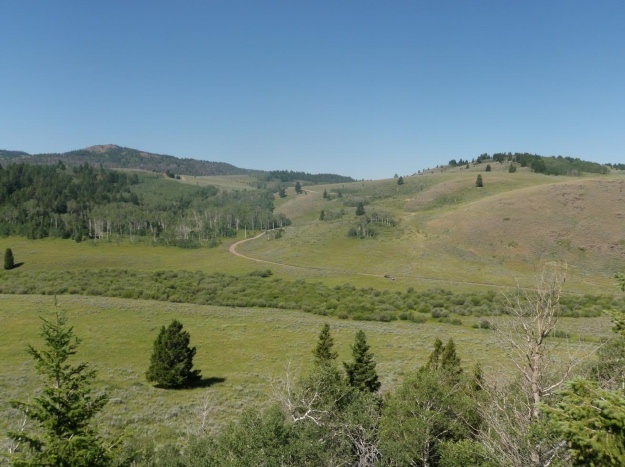 Our field area, Antelope Basin. A view of Saddle Mountain. Some nicely sheared rocks in an outcrop in Antelope Basin. 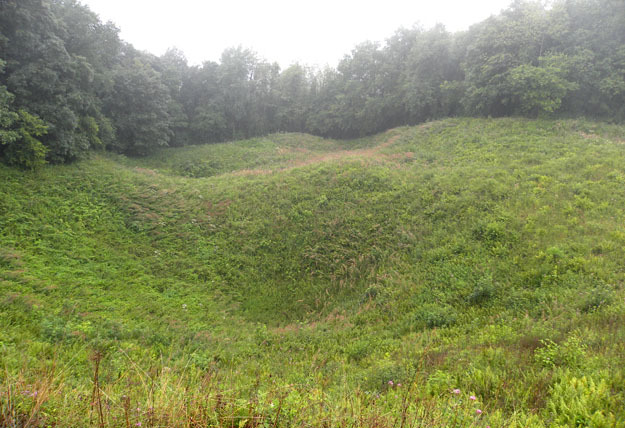 Mine craters on the Butte de Vauquois, northeastern France. VIENNE LE CHATEAU, FRANCE–The influence of geology on war is shockingly clear on the Butte de Vauquois (N 49° 12′ 20.20”, E 5° 4′ 11.42”). 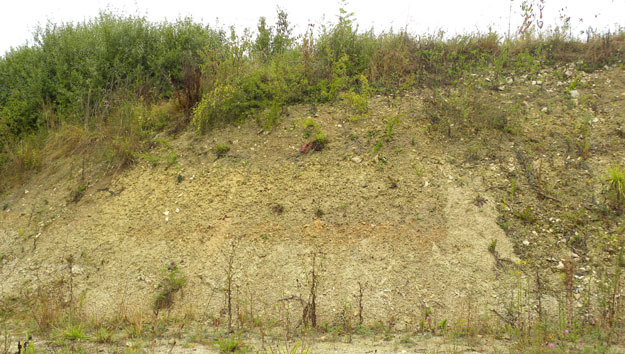 This large hill (290 meters in elevation) is an outlier of the chalky detritic sandstone (silicarenite) [thanks, Jean-Claude Porchier] backbone of the Argonne Massif, with the small village of Vauquois originally on the top. (That “originally” should give you a clue to what’s coming.) 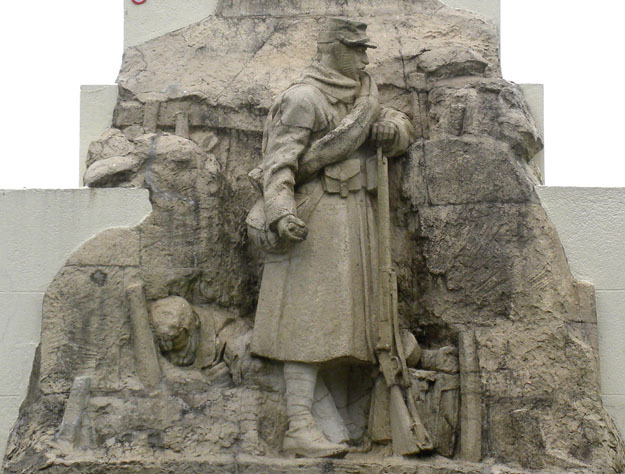 It had immediate strategic value in September 1914 when the invading German Army captured it and began to shell French supply routes to Verdun running alongside the Aire River. The French desperately wanted it back. The French Army attacked the Butte de Vauquois with thousands of men several times. 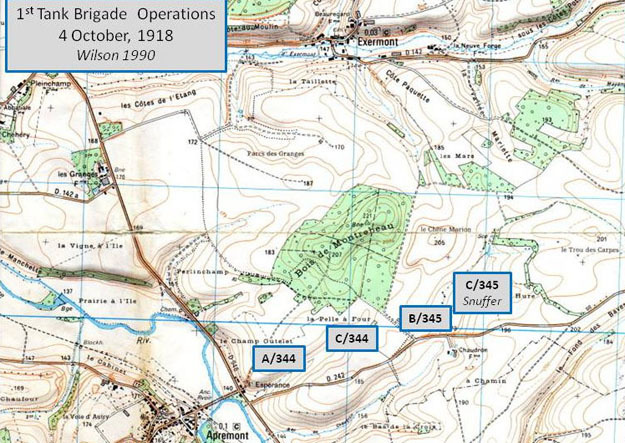 Since they lacked the strategic advantage of topographic height, they suffered enormous casualties, only capturing the southern side of the hill in March 1915. The top, with its ruined village, became a no-man’s land. The French then began building mine tunnels through the dry and stable bedrock towards the German lines. 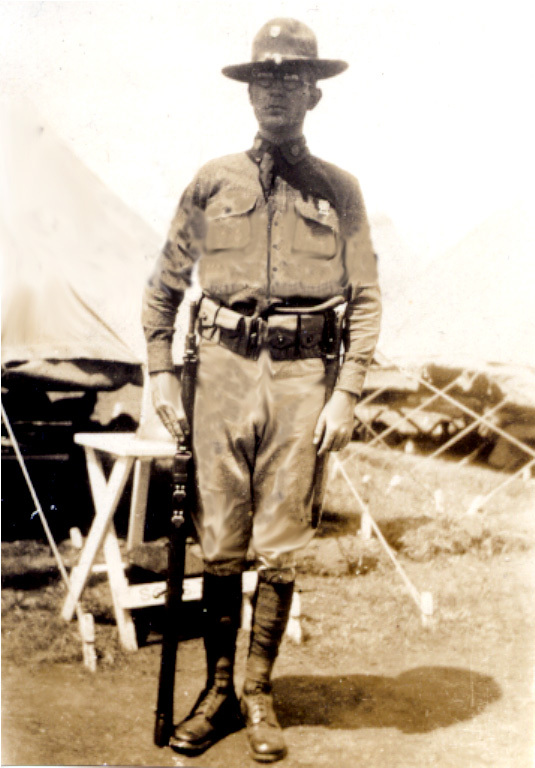 Soldiers from coal-mining areas were employed to dig caverns underneath the German trenches. These excavations were then filled with explosives and ignited, creating massive craters on the surface which troops attempted to exploit. 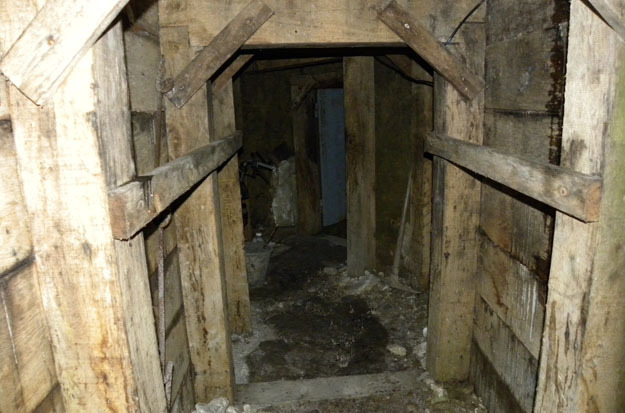 The Germans, who employed over 100 military geologists in their ranks, responded with their own tunnels and explosions under the French lines. Eventually almost 25 miles of tunnels riddled the Butte de Vauquois, with each side building explosive caches and attempting to intercept the enemy tunnels. An astounding 531 French and German mines were exploded here by September 1918, splitting the hill in two parts with a row of craters. The destruction was so immense that the village of Vauquois completed disappeared. Thousands of soldiers on both sides were killed here, with 8000 completely missing and presumably buried in collapsed tunnels and trenches. A tunnel constructed in 1916 from the French trenches into the Butte de Vauquois. This hellish underground war finally ended in September 1918 when the American First Division bypassed the hill during the first day of the Meuse-Argonne Offensive and the Germans retreated. To this day only a few of the Vauquois tunnels have been reopened. There is still much unexploded ordnance in the mines, and no one wants to disturb what has become a massive tomb. 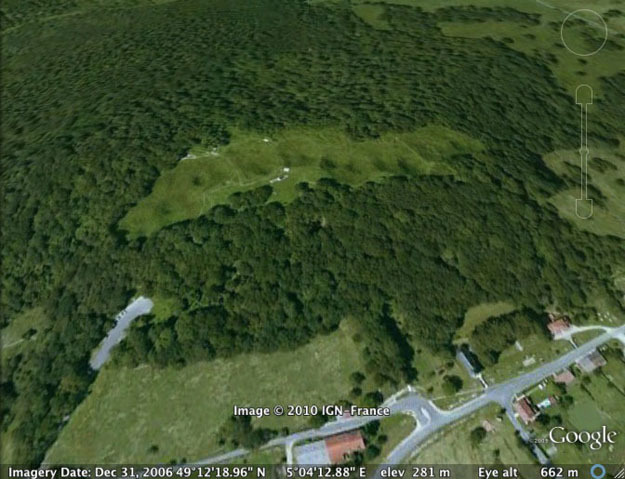 Google Earth view of the Butte de Vauquois, with north at the top. The chain of craters through the middle of the hill is obvious. The tiny white dots on the southern edge of the craters near the middle of the image include the monument pictured below. French monument to the dead on Butte de Vauquois. 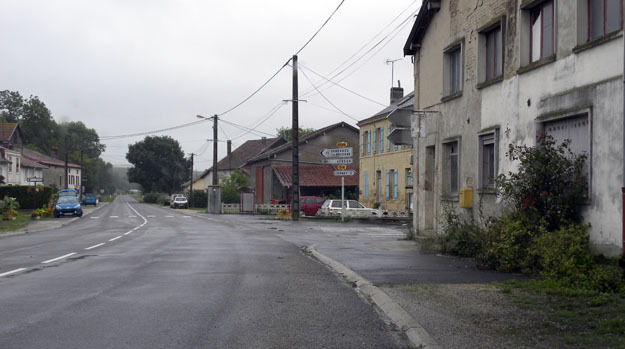 It stands where the village of Vauquois was completely erased by the underground war. The entire group at the On the Cutting Edge Workshop (Teaching Geoscience in the Field) spent a few hours in the field talking about various teaching strategies. 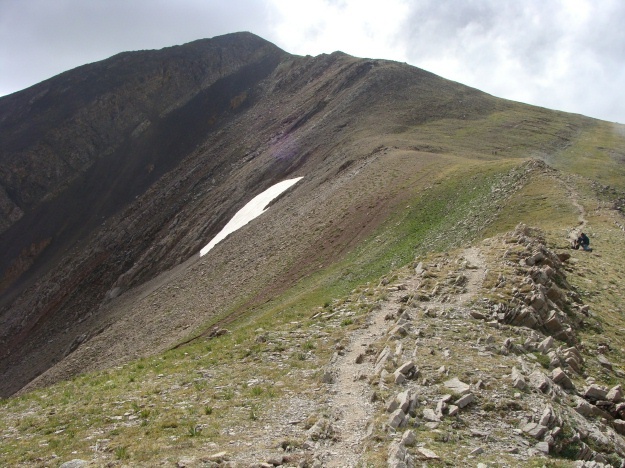 Our field site for this exercise was the Bridger Range, and we climbed to Sacagawea Saddle. Fortunately, on the climb up, Terry Pavlis (structural geologist at UTEP) gave me a Trimble Juno with ArcPad to use so that I could try this digital mapping technology out in the field once again. The view from Sacagawea Saddle was gorgeous, and we had a great conversation about teaching pedagogy at the top. View of the Paleozoic carbonates that are wonderfully exposed along the climb toward Sacagawea Saddle. This area is in the Gallatin National Forest. Notice the huge talus pile and the remnant snow in the photo.